Remember how I became a master potter? 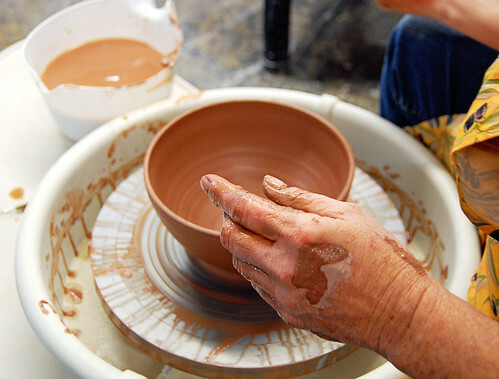 These potter hands actually belong to Tena Payne, the owner of Cahaba Clayworks. Their artists manage to fight the instinct of every blob of clay. Which is to become an ashtray. Then they throw on some paint and some glaze and call it a productive day. And adding feet. They're like little Ewok feet. Yes, I run like an Ewok. And I'm a master potter. Because of these two relative truths, I'm giving away the lovely piece of pottery above. And enough Barnes & Noble moolah to buy a sassy book to keep it company - $20. 1. Be a fan of Jamie's Rabbits on Facebook. 2. Be a follower of potter Tena Payne on Twitter. Important Details: I love all countries, but this contest is limited to those living in the US. Must enter before 11:59pm CST on Monday, April 12 to qualify. Winner will be chosen randomly using Research Randomizer and announced on Tuesday, April 13. 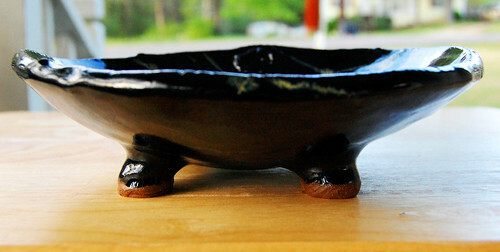 The pottery will be mailed and the gift certificate will be emailed. Obviously, anonymous folks can't win unless they leave a name/email in the comment. The pottery was generously donated by Tena Payne and Barnes & Noble doesn't even know me. Hi, Jamie! Missed you over Easter! I love your posts! My favorite hobby is genealogy, but with the addition of the second little bit around here, my research time is scarce. So, my favorite hobby that I can actually do with a two year old in tow is gardening. I have a lovely garden that is all pollen yellow right now. Achoo! My favorite hobby is reading (and following blogs)! I was already one of your FB fans and I'm delighted to now follow Tena on Twitter. 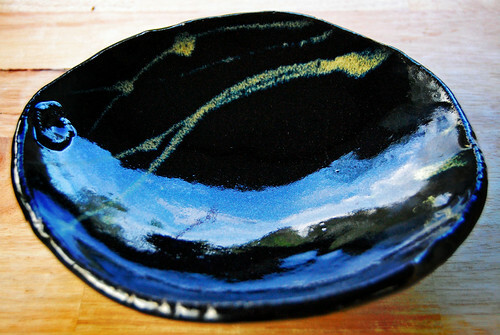 I'm a big Tena Payne fan and have a decent pottery collection --- including many Tena Payne pieces (a Bellagio bowl like the ones she's just put on sale via Twitter and a piece like the one pictured above, but in a different glaze). Would love to be a potter myself but lack the patience. I have the wheel, kiln, clay, tons of supplies... just haven't gotten back to trying it. Maybe one of these days, eh? Hoping in a few years I can list throwing as a favorite hobby rather than just collecting pottery. My favorite hobby is rubber stamping and card making! Actually I love to knit. I find it pretty therapeutic and calming. I'd love to be on the east coast and maybe get involved with the secret group of knitters who are embellishing trees and signs and fences in the dead of night. my favorite hobby is cooking! My favorite hobby is reading, reading and reading. FB fan of Jamie's Rabbits. I love to cook & read! 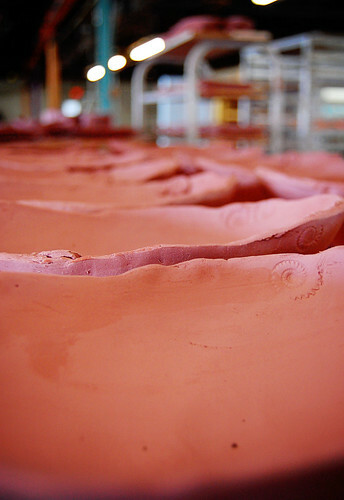 I loved pottery in school! Oh, how I'd love the opportunity to have a go at it again. My hobby, if one calls it that, is reading. You see, I'm a librarian, so I should have plenty of time to read, but I'm also a student/mom/wife/blogger. My reading time has been cut due to school work. I can't tell you what I'd give for an afternoon in Barnes and Nobel...hot coffee and good book in hand. Should I win, I have a great place for that lovely piece of pottery. I'd place it on my book shelf in the front room. I'm a fan of Jamies Rabbits on FB. My favorite hobby is reading blogs! That, or baking. I think my favorite hobby is reading. But I also do quilting,sewing,knitting,crocheting,cross-stiching,needlepoint,painting, and gardening. I always have something to do. Some people think of cooking as a chore, but I absolutely love to whip up all sorts of delicious things. Cooking is a major hobby of mine. I do it just for fun! My favorite hobby is reading and also creating things with perler beads. My favorite hobby is reading. I find an author I like and then read all their books. My favorite hobby is reading. I have a book collection to last me a lifetime! I follow Tena Payne on Twitter! I enjoy reading and thrift store shopping. This might sound like strange hobby, but I love to use coupons and see if I can keep our grocery budget under $190 a month for our family of 3. Honestly, it really is a hobby for me! I love love love to knit. If I am not out exercising or helping with family I am knitting. If I do not take a project bag with me just anywhere then I am asked if I am ok. So I love to knit. my favorite hobby would have to be scrapbooking...or writing! My favorite hobby is playing and listening to music. I love to read and I love your pottery so this is the perfect contest for me to win! I'm into scrapbooking, rubber stamping and card making. I've recently branched out a bit on that and am doing papercrafts on old paint cans and frames. Yard Saleing and trying to figure out what LOST is about! I like to scrapbook and make my own greeting cards. I'm a fan of Jamie's Rabbits on the book! My favorite hobby is travelling! I'm an avid gardener! This is my favorite time of year too...just as things start to pop out! I'm a follower of potter Tena Payne on Twitter. I know I am lame but Reading is my all time favorite!!! I also greatly enjoy Blogging, but it's not really a hobby anymore. It is a real job!!! I am a twitter follower of Tena. My favorite hobby is any kind of crafting, card making, crocheting, polymer clay, doll making. I would love to win , thanks for the chance. My favorite hobby is entering sweepstakes & contests. My favorite hobby is going to thrift shops. I became a fan of Jamie's Rabbits on Facebook. I became a Facebook fan of Jaimie's Rabbits. A fellow Star Wars nut Woo-Hoo!!!!!!!!!!!! My favorite hobby is photography. I love to take pictures AND I love to see other's perspectives. 2 people can look at the same thing in totally different ways. I am a facebook fan and following on twitter. My favorite hobby is sewing, but I love all things arts and crafts. Doing yoga is my favorite hobby! I would say my hobby is sort of photography and scrapbooking. cdziuba@aol.com Baking and decorating cakes! Lately it is photography. And sleeping. My favorite hobby is cooking!! 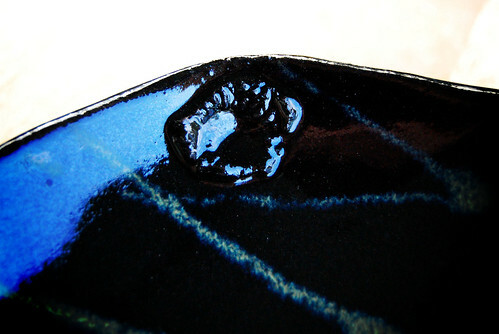 My current favorite hobby is glass fusing. Reading is my favorite hobby, but I collect clothes that need buttons or mending and there are times when I find this very soothing. My favorite hobby is making stuffed animals for my kids and nephews. Hobbies are reading, writing and making music. Signed up as a fan of Jamie's Rabbits on Facebook. My absolute favorite hobbies in the world: making jewelry and reading! My favorite hobby is reading. I love reading a book every day. My very favorite hobby is cake decorating, but, I have lots of other favorites, painting, reading, teaching children's crafts, reupholstery, to name a few. My favorite hobby is reading there is nothing better than relaxing and reading a great book! I follow Tena on twitter! My favorite hobby is scrapbooking. My favorite hobby is making jewelry - I love it as you get totally absorbed in the concentration and pattern design! My favorite hobby is reading. It helps me escape the hectic days! I'm not sure riding my Harley qualifies as a hobby. If it doesn't, I like making napkin rings for each season and holiday. I make them out of clay. Pick me, pls. Many thx. My favorite hobby is baking, closely followed by scrapbooking. My favorite is paper crafts followed by reading. Mine is scrapbooking. Although my daughter is now 8 and I am still on her 4th year. LOL. My favorite hobby is planting a vegetable garden. I like reading or shopping for bargains. My favorite hobby is games. My hobbies are reading and listening to music. My favorite hobby is reading, with hand needlework coming a close second. Oh dear, my favorite hobby? Sleeping (cause I don't get enough)? If I had all the time in the world and was caught up on everything, including all the books I want to read, I'd vote for getting back into making stained glass!! My favorite hobby is bird-watching, and taking pics of them. Thanks! ps - LOVE your pottery! My fave hobby is Reading. My favorite hobby in the whole world is doing family history! My hobbies have change through the years...right now I'm having fun doing sweeps. My hobbies are running and scrapbooking. My favorite hobby is watching tv. My favorite hobby is photography. I take pictures whenever I can and am always saving up for my next camera. My hobby used to be blogging, but I'm so busy these days. So I guess now it is couponing! Hi there! My favorite hobby is reading. And the pottery is simply lovely. Thanks! Favorite hobby is cooking new recipes with ingredients I haven't tried before. My favorite hobby is gardening! Jamie's Rabbits facebook fan (Angela Townsend). Tena Payne twitter follower (ThatKittenMimi). Couponing. This hobby pays me! I enjoy reading & tackling new sewing products.